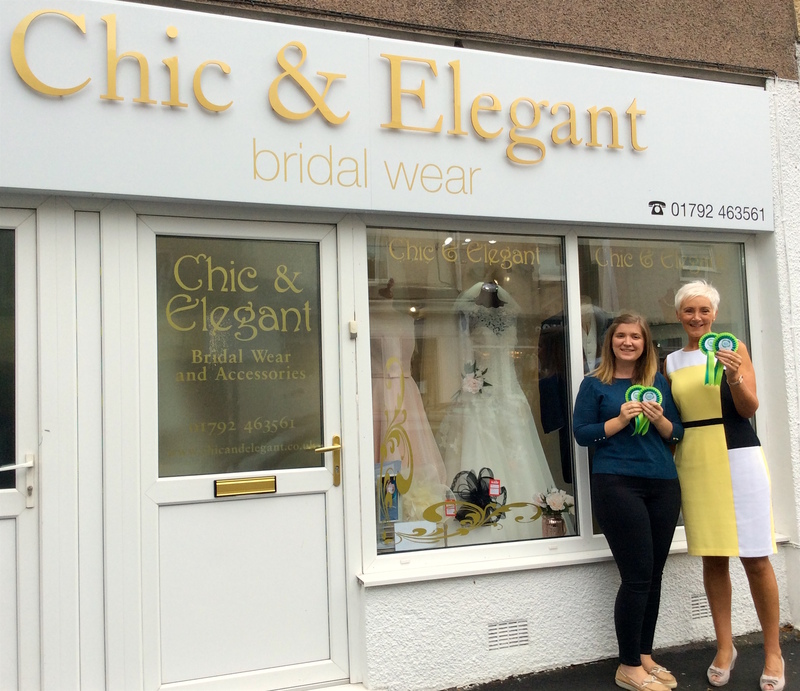 A Swansea City Centre bridal shop, which has helped to create thousands of fairytale weddings, has been recognised with a Swansea BID Extra Mile Award for outstanding customer care. Chic and Elegant, based in Mansel Street, has been giving stellar service to brides, grooms and their families before the big day for more than 20 years and going over and above to help create an enjoyable experience. Swansea BID’s Extra Mile Awards were launched this year to recognise businesses of all kinds throughout the Swansea BID area whose staff go the extra mile to keep their customers and clients happy. They are also designed to give local businesses a boost for the hard work they carry out day in, day out, to help keep the City Centre vibrant and unique amid challenging conditions for UK retail. Linda Hurford, owner of Chic and Elegant, said: “I’m very pleased to be a Swansea BID Extra Mile Award winner – particularly since the award is based predominantly upon feedback from our clients and customers. “The whole ethos of Chic and Elegant has always been different, in that we offer an appointment only experience, so the bride and family have our complete attention. We take time to really understand what the client wants, to give sound advice based upon our many years of experience, and to make sure the client feels valued, unique and unrushed. Swansea BID chooses a winning Extra Mile business every quarter, based upon positive customer reviews and feedback, and upon the observations of the Swansea BID team itself. Projects Manager at Swansea BID, Amelia Rudman, said: “I’m delighted to see Chic and Elegant receive a Swansea BID’s Extra Mile award, in recognition of the very attentive customer care they provide. “Businesses up and down the country are operating in times of great changes in the way we spend our leisure time and our money, and we are proud of the way Swansea BID Businesses are adapting to meeting the expectations of their clients and customers. Swansea City Centre itself is also, of course, going through this exciting regeneration phase which is having an impact on businesses on the ground and it is important that we continue to show them our support. The winning businesses will receive a winner’s rosette, window sticker and website artwork so they can shout about their great customer service, and they will be profiled on the Swansea BID’s website.